With the summer months we spend more time with the family at celebrations and it had me thinking about some of our favorite traditions, memories and just funny stories we tell about what we have had happen as a family. For the current Frilly and Funkie challenge "All in the Family" is to create something inspired by your family. Whether it is your ancestors, a favorite family memory or family outings, create a vintage or shabby chic project reflecting your family. It seems to be the norm at the moment that nothing springs to mind straight away so many hours (literally) of thinking about different ideas follow and it was only when I walked out into the garden and saw a Fuschia flowering that it triggered a memory of my Dad. Sadly he is no longer with us but I have fond memories of him in the garden and his greenhouse and Fuschia's were his favourite flower. I've had this large MDF tag for a while and thought it was high time that I did something with it. 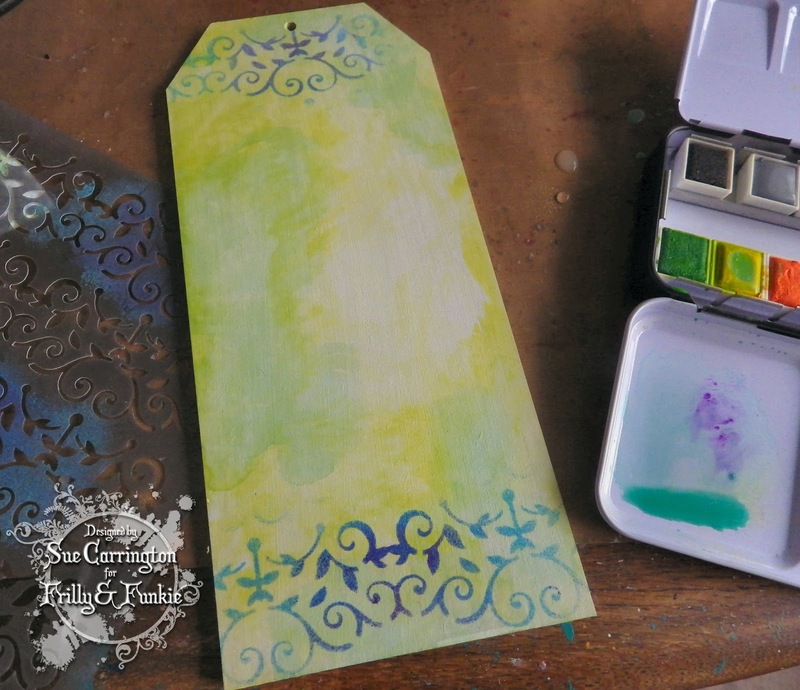 I gave it a base coat of Gesso then using the beautiful Prima watercolours gave it a wash of colour. I used the watercolour paints with a Prima stencil to add some delicate detail across the top and bottom of the tag. 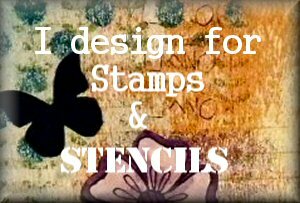 I continued to build up the layering of stencilling but keeping it really light and delicate. Now I didn't have a stamp of a Fuschia but I'd recently watched a video of Fuschias being painted onto Yupo paper and saw how easily just the basic shape could be effective. So, I picked a flower head from the garden and used it as my reference point to sketch the flowers and then paint using the Prima watercolours. 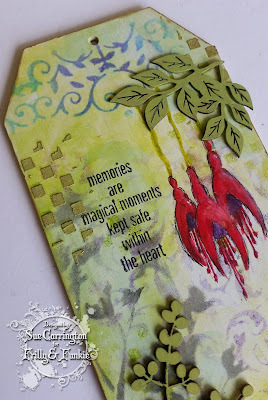 This stamp from Wendy Vecchi just seemed to hit the nail right on the head for this project. The leaves are from Linda's Funkie Junkie Boutque and they've been painted with acrylic paint. 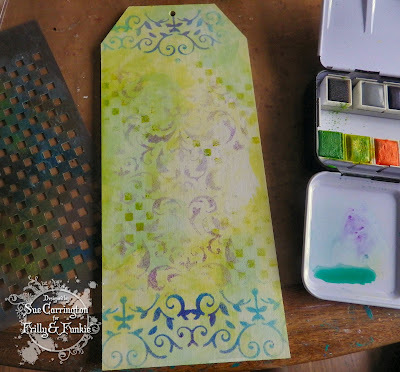 I added some texture using Ranger Texture paste mixed with some green acrylic paint spread through another Prima stencil. When it was dry I rubbed some Treasure Gold lightly over the raised surface. To frame the whole piece I rubbed Wendy Vecchi gold embossing paste around the edges. This is a simple project but I really like how it turned out and the memory that goes with it is very special to me. I hope you get chance to join us for this challenge and do make sure you hop over to the Frilly and Funkie blog to see the rest of the DT's fabulous projects. Fantastic tag! Your fuschia's are so wonderful and that you hand drew and painted them is really wow. What a beautiful memory and remembrance of your dad! 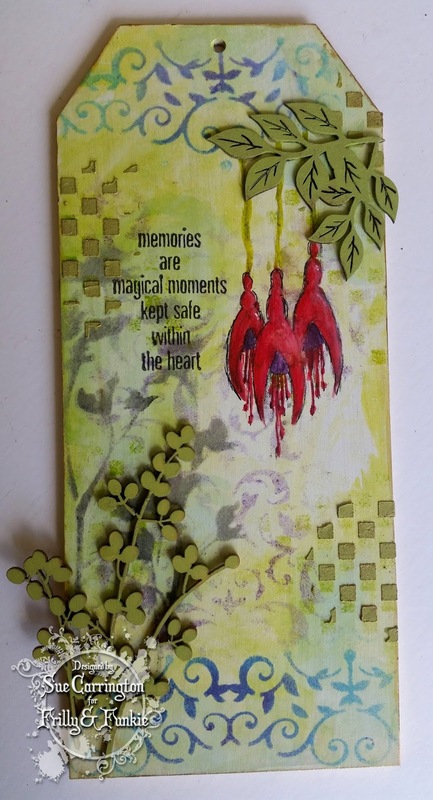 Fabulous tag and your Dad would be thrilled to bits with your Fuschia flower and the happy memory it brought to you. Your flower is beautifully painted and simply pops against your wonderful background. 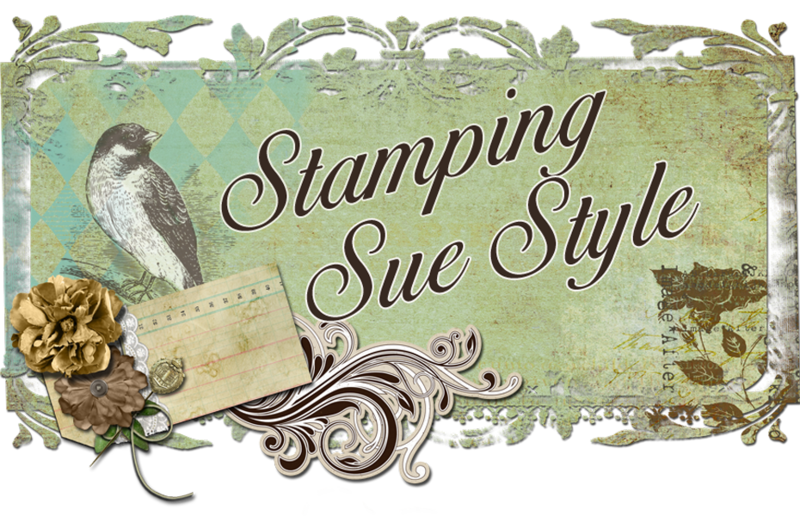 I am in love with your beautiful tag, Sue! What a fitting tribute to the memory of your father. The layered background and your gorgeous hand drawn fuschias are a sight to behold. Thank you for the wonderful step by step as well! A lovely tribute to your dad! I'm so impressed with the the gorgeous painting you've done here! Those fuchsias are gorgeous! A really beautiful tag! The fuchias really are the focal point and then you see the pretty greens. Lovely quote.